The LoiLoScope 2 video editor is so unusual in appearance and approach that you need to download it and take a look. Even if you're not into video, the interface and editing tools are fun to play with, and they demonstrate just what's possible when truly creative minds are at work. It's a program, it's a desktop…LoiLo Scope 2 seems odd at first, but is supereasy to work with once you learn it. The interface--a resizable, scrollable desktop within a window--is what sets LoiLoScope 2 apart. All functions are available as movable objects on the desktop: collections of video, a DVD/Blu-ray producer and burner, individual video and music clips, the media browser, timeline editors, a video recorder, and so on. It's like having a virtual PC dedicated to video. LoiLoScope 2 is packed with timesavers, too, such as automatic playback and a preview that appears when you hover with the pointer. To shorten the learning curve, use the program's step-by-step tutorial wizards, which tell you what to do and let you do it at the same time. Once you know LoiLoScope 2, it's exceptionally easy to use. Although LoiLoScope 2 doesn't throw a lot of menus, tabs, and toolbars at you, it's quite powerful. You can do virtually everything in real time or apply changes while the video is playing. You'll also find multiple timelines and numerous effects (such as a blur function to hide faces) that you can draw onto the screen as the video is playing. On top of that, LoiLoScope 2 includes a wide array of filters: brightness, color change, flip, free rotate, glow, invert, layer position, picture-in-picture, and transparency. Lean and mean, LoiLoScope 2 opens quickly, performs tasks rapidly, and has an all-around snappy feel as well as a relatively small disk footprint. In terms of feel, it puts other video editing programs to shame, especially when it's utilizing ATI, Intel, or Nvidia hardware acceleration. LoiLoScope 2 is largely in step with the modern world. It outputs to common PC and mobile-device formats, and interfaces with Facebook, Vimeo, and YouTube. You could wish for more social destinations, but most users will be happy. The company offers help on Twitter. File support is mostly up to snuff, but you can expect the usual no-shows, namely FLAC and APE in the audio department; Targa, PCT, and EPS for photo files, and Ogg Theora video. The program understands DirectShow filters and uses them for QuickTime files if you so choose, so adding support for the aforementioned types should be easy. I found a couple of exceedingly minor issues with LoiLoScope 2. For instance, thumbnails, which it creates dynamically (and aren't always cached), don't consistently render in a timely fashion. And to delete a timeline, you must do so through a menu rather than drag it to the trash as you can with other elements. That's it. As I said--exceedingly minor issues. You should take a look at LoiLoScope 2. Really. Do it even if you're satisfied with your current video editor. But be warned: Satisfaction with your reigning favorite may vanish in short order. 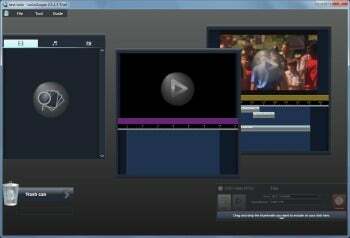 A unique interface and simple real-time video editing make LoiLoScope 2 an attractive download.